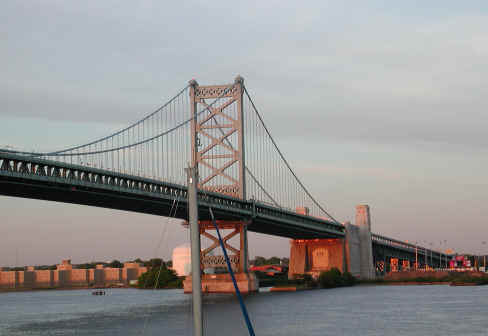 Until the construction of the Ben Franklin Bridge in the early part of the 20th century, the only way to cross the lower Delaware River was by ferry boat; Walt Whitman ventured back and forth from industrial Camden this way. But something more permanent was needed to allow rapid, large-scale river crossing. Given advances in engineering around the turn of the century, the technology for a long suspension bridge that would permit river traffic below and car/train traffic above was now available. 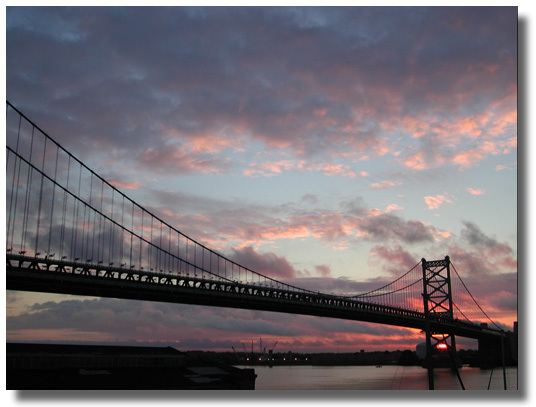 All that was left was the need to raise money and to work between governmental authorities, so a new agency was born: The Delaware River Bridge Joint Commission (now known as the Delaware River Port Authority or DRPA). 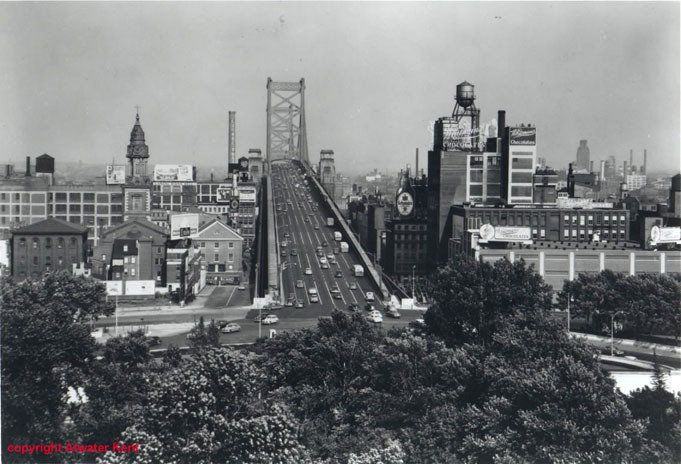 This agency, a cooperative venture of the states of Pennsylvania and New Jersey and the city of Philadelphia, began planning the bridge the Delaware River Bridge in 1919. They hired a local engineering firm led by Polish-born Ralph Modjeski (1861-1940) and a well known French-born American architect who did considerable work in both countries, Paul Philippe Cret (1876-1945), to design the bridge. Modjeski was a renowned engineer who was a bit of a legend in the bridge business. 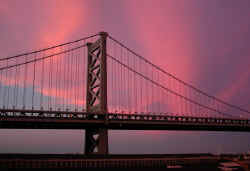 In addition to the Ben Franklin Bridge he also was chairman of consulting engineers for the San Francisco-Oakland Bay Bridge along with about 50 other bridges. Cret was a major exemplar of the Beaux Arts school or architecture and designed a number of museums, libraries and monuments as well as more mundane structures such as bridges. Read a bit about this collaboration and how it was established. And they were certainly thinking big: the plan was for the world's longest suspension bridge at a cost of $40,000,000. Construction was begun in 1922, and the bridge was opened to vehicular traffic in 1926. 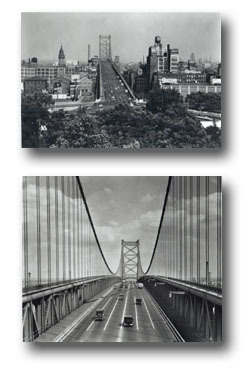 To the right are some photographs courtesy of (and copyright by) the Atwater Kent Museum in Philadelphia that show the bridge in the 1930s. While the original plan for the bridge called for the demolition of St. George's Church, the oldest Methodist church in the United States, a lawsuit resulted in the relocation of the bridge and a modest 14 foot space between the church and the Philadelphia base of the bridge. You can see the church in the upper picture. It's the one without the steeple. As the bridge was preparing to open, there was a debate about whether or not to charge tolls. 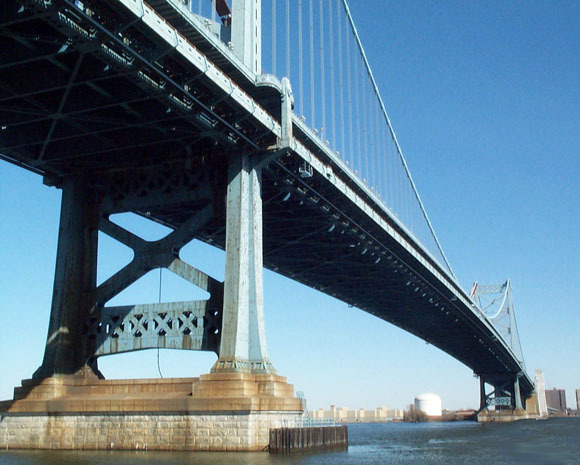 It might be surprising to know that only the New Jersey authorities wanted to collect tolls until their investment in the bridge was recouped. 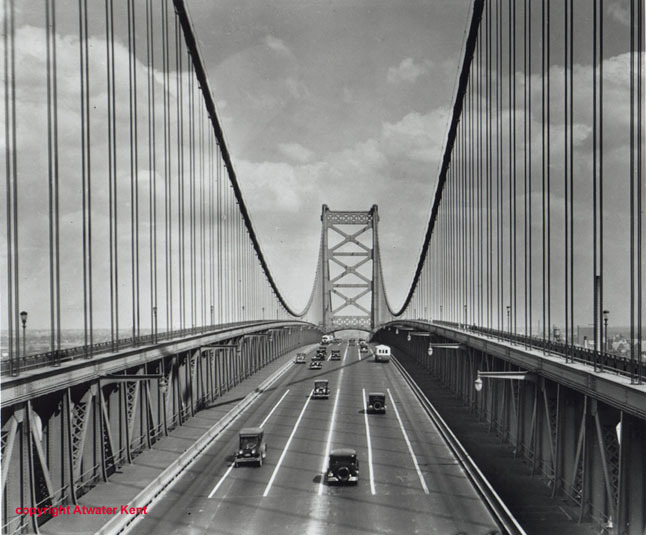 In a compromise, the Pennsylvania and Philadelphia delegates agreed to tolls to prevent a lengthy court battle (this case had already to gone to the US Supreme Court) and to open the bridge on time. One reason for getting it opened by then was to allow people to visit the City of Philadelphia's somewhat unsuccessful Sesqui-Centennial celebration of the constitution. The official opening was July 1, 1926 where a quarter-million pedestrians enjoyed the bridge before cars were allowed to cross at midnight. 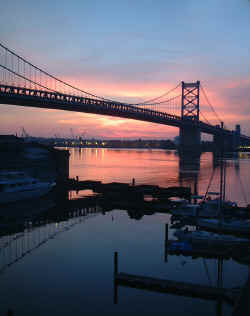 The Bridge served the bustling waterfront district of Philadelphia and even replaced some piers used for shipping. 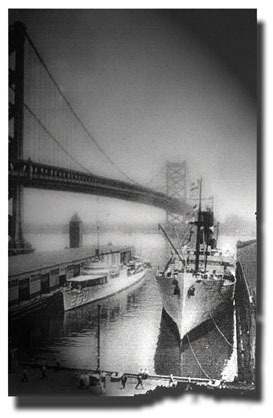 The early 20th century saw the construction of large piers and these were instrumental in maintaining domestic and international trade through the ports of Philadelphia and Camden. 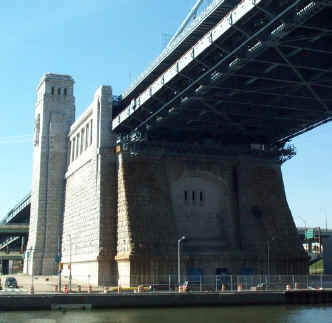 Two drawings from the Independence Seaport Museum (shown under Bridge Pictures below) show these engineering marvels of 100 years ago. Many of these piers are still being used... some for their original purposes and some for housing. 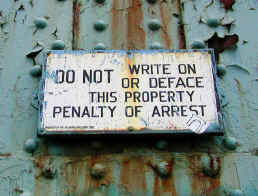 The tragic accident at Pier 34 illustrates some of the problems with building using timbers stuck deep into river mud. It is quite miraculous that with meticulous care these piers can still support heavy duty activities to this day. 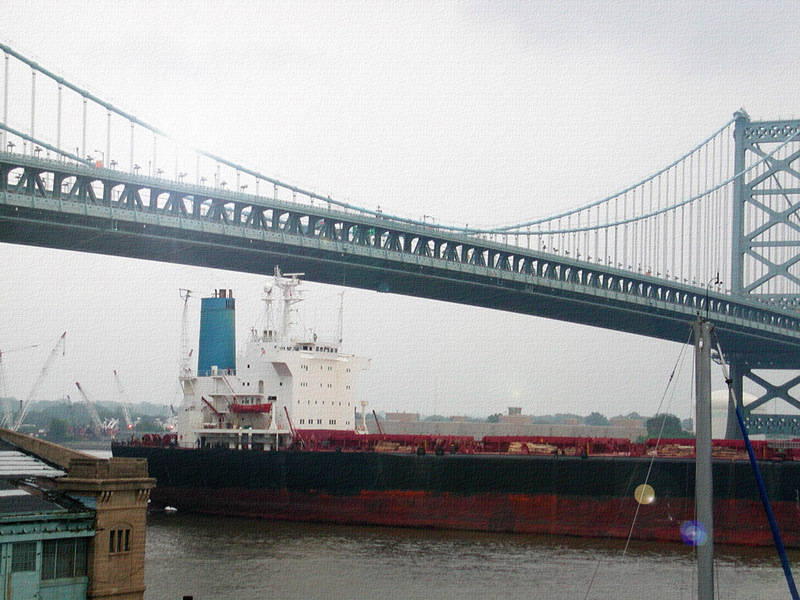 In the photo to the left you can see large ships berthed at Piers 9 and 11 just south of the Ben Franklin Bridge. These piers are about 500 feet in length and can easily accommodate ocean going vessels. One reason for building a bridge of this height was to permit the passage of large ships further up river to the bustling piers to the north. The picture below gives you an idea of how large the vessels are that go under the bridge. 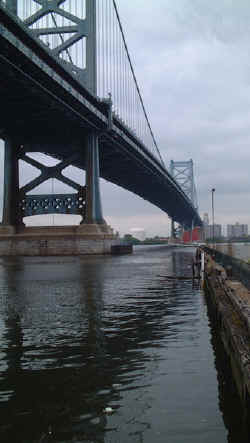 The bridge was re-named for Benjamin Franklin in 1956. Its blue color allows it to stand out from other bridges and creates a striking vista by day. 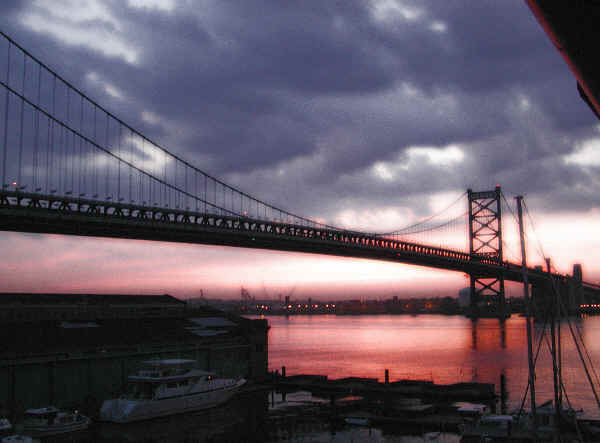 In 1987, as part of the celebration of the bicentennial of the Constitution, a privately funding lighting scheme for the bridge was implemented. It is no exaggeration to say that this bridge lighting project was the key to the redevelopment of the waterfront. Turning a simple bridge into a kinetic light sculpture generated a buzz that made restaurants and nightclubs seem like a natural extension. The lighting was designed by the architectural firm of Venturi Scott-Brown and consisted of bright lights aimed at the cables of the bridge. After dark the lights come on and the cables glow an ethereal whitish-blue color. At intervals the lights flash off and on giving a sinuous quality to the bridge. Initially the lights were synchronized with the passage of PATCO trains, but the current schema is much more fluid and there is no discernible pattern to the flashing lights. During the repainting of the cables the lights were off much of the time, but they're back now. On cloudy nights there are 2 bands of light in the sky above the bridge which can be quite an interesting effect. A new lighting scheme for the bridge has been added. In addition to the old lights shining from above the roadway directly upward to the cable, there are 4 new features. The anchorages have been illuminated as have the towers. There is a row of lights along the span itself (red, white and blue here, but changeable) and white lights along the pedestrian span on both sides. This lighting effect modification is quite dramatic. The rendition to the right is what I call tutti-frutti with a rainbow of lights on the towers. Despite the rusting steel and the peeling paint, the bridge at night can look really magical. This photograph has been "Photoshopped" a bit to bring out the colors in a more painterly way, but it is really this colorful. In addition to seven lanes of motor traffic, the bridge has a high speed urban rail line on either side as well as a walk/bike way. While Interstate 676 feeds into the bridge at both ends, the actual structure is not quite up to interstate highway standards. So for now, the bridge is still US Highway 30. In any event, the bridge gives us a great way to get to Camden (below). In the photo below you can see the Camden waterfront including the Rutgers campus, the Aquarium and the Entertainment Center. The USS New Jersey is now also docked in Camden and is open for tours. The bridge is always under some form of repair or maintenance. Though oddly the project seems to have come to a halt in the past year with the span west of the Philadelphia anchorage rusting and brooding. "During the first year, the bridge took in more than $2 million; over that summer, extra toll collectors caught money in paper bags to help move the lines along. Most vehicles were charged a quarter. A pedestrian leading a horse, mule, cow, hog or sheep had to pay 20 cents to cross. If you rode your horse, it was only 15 cents. Bicyclists paid a dime." 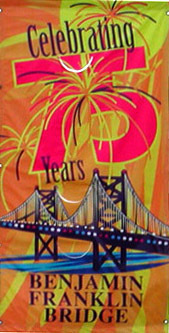 The bridge is celebrated its 75th anniversary on July 1, 2001. Click on the banner to learn about the festivities. Does this bridge have stats? You bet! It is currently about the 34th longest suspension bridge in the world. Below are figures that might mean something to you. 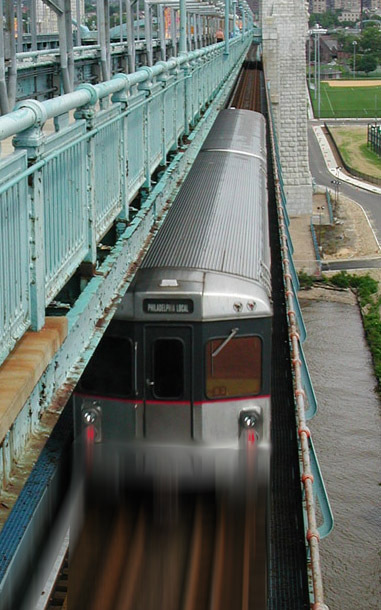 Click on the image above to see the bridge express its different moods; click to the right to see what passes under the bridge. If you click here or on the photo at the top of this page you will find a link to another photo album of the bridge. 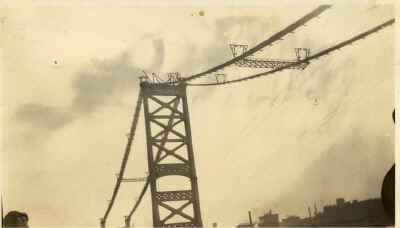 The picture directly below is a view of the bridge under construction in 1924. 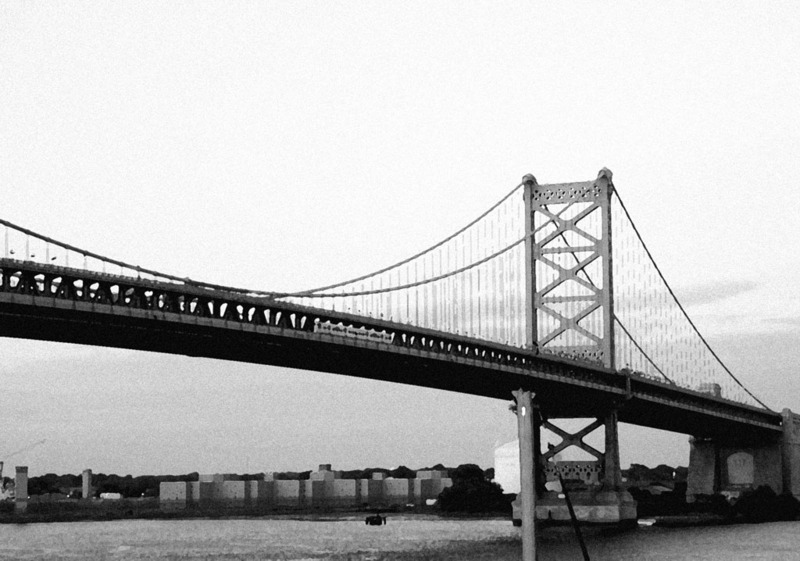 Below that is a panoramic view of the Delaware River in September, 2000. Click for full size view.